WARNING PIC HEAVY!! So on the 28th September STitch was unfortunately written off by an idiotic BMW driver that pulled out on me on a crossroad, I swerved to avoid but was too late and ended up colliding with his front end, bounced off and ended up in a brick wall . At the scene the other driver was hell bent that it was my fault when I was completely in the right, as eyewitnesses overheard the argument and said if you are going to dispute blame there is CCTV footage surrounding the junction and the evidence will be there clear as day. As soon as this was said he went very quiet and changed his story that apparently there was a bus letting passengers off on the corner of the junction when there was no bus in sight and didn't see me. The first week of the claim my car was categorised as a CAT B write off and the insurance paid out, The second week the insurance rang me up saying he has admitted full liability and that my no claims bonus would be unaffected and the claim was now on a non fault basis on my behalf. 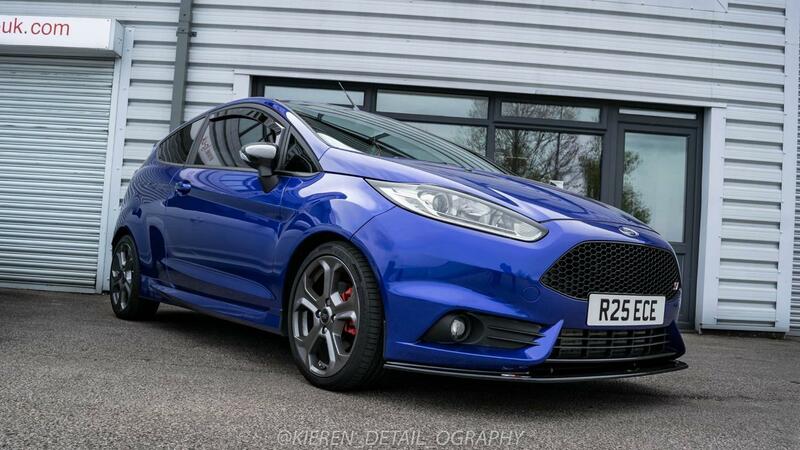 The third week my GAP insurance paid out and I was able to place my deposit on STitch mk2! And finally the fourth week I collected STitch mk2 and I was back in the ST lifestyle as I collected STitch on the 29th October. Here are some photos of STitch mk1 And the BMW that hit me a 420d MSPORT with all the optional MSPORT kit And finally STitch mk2!! the modding has already started again! I had taken her back to standard a week before so I was able to retain all my parts I had. Parts I saved and fitted: Milltek Non Resonated Race Cat Back R-SPORT Decat R-SPORT Stage 2 Intercooler BR Motorsports CAIS (SOLD) Tripple R Splitter LED Reverse lights 4500k High Beam 6000k HID Dipped Beam 6000k Fogs LED Number plate ballasts LED Footwell lights LED Boot Light Chrome front indicator bulbs TEAM HEKO Wind Deflectors Focus Zetec S Short Ariel Parts I lost: Carbon Interior Trim (Steering Wheel Surround and Door Handles) Spare Wheel Mountune Spoiler Extensions Blue Induction Hose All my upgraded bulbs Inc HID's Focus Zetec S Short Ariel New Parts on Order/ Have: Mountune Quick Shift Mountune Rear Engine Mount Mountune Induction Hose (GREY) Mounune Charge Pipe Kit (GREY) ITG Induction Kit Mountune Spoiler Extensions (Hydrodipped in Carbon) Turbosmart Plump Back BOV H&R 35mm Lowering Springs I was given a 2.0L Diesel Audi A3 as a courtesy car from the insurance, Yes by all means it was nice and kicked you up the bum when you put your foot down but as it was only a Sport and was a derv it was no fun at all but it got me around. Then I was given a 1.0L 100hp Titanium X Fiesta from work and by got I was over the moon to be back in a ford, I was pleasantly surprised how nippy them 100hp 1.0L are! 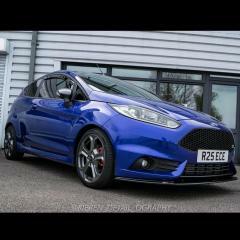 I had that for 2 weeks while I was away on training then back home to my new ST waiting for me to pick up! Well a new chapter has started and I am a hell of a lot more financially better off so at least some good has come out of it and thats before all my personal injury comes through. As I bought my car on privilege for £17328 the balance on my finance at the time of the crash was £13360 and the car was only 10mths old at this point. The insurance paid out £13700 which they had to temporarily subtract my excess which is claimed back from the legal side of things which brought me down to £13000. So even if i had no GAP insurance i wasn't going o be crying I had thousands to pay off, but with my GAP insurance I had vehicle replacement on there as well and i would recommend anyone to have that on theirs too!. 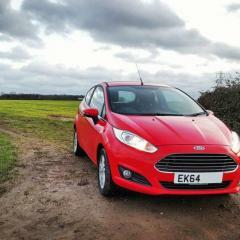 The GAP paid out £6415 which returned it to list price minus the Ford £1000 deposit contributions. So at the end of the day I have come out with £6055 in my back pocket all from a £100 GAP policy so think twice before you decide to not take out GAP. For anyone wondering I had a Total Loss GAP Policy and the price on my new car was even cheaper than last time for the same cover, WINNER!! 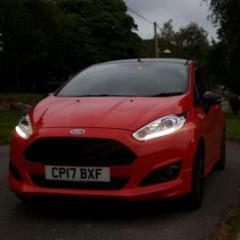 Well I will try and keep updating my progress on here more often I am more active on the Fiesta Mk7 and Fiesta Mk7 and MK7.5 Parts pages, You will probably know of me on there but I thought I would update you all on here now everything is completed. The back of my key I got wrapped but just bought some DMB carbon overlays to replace them. I got my ST keyring of ebay bud think it was only a fiver. I dont know whats wrong with the ST wheels but there as common as s*** in work for leaking valves, paint flaking a guess its just a massive bad batch of wheels. possible dpf issues when you floor it the car sees that the dpf maybe blocked and puts the car into a sort of limp mode to prevent any possible back pressure in the engine and destroying your engine. Ive already started pal to date I have done :- - De-Tango - Blue Led footwell and boot lights and changed map lights to xenon white - LED Number plate lights - Private Plate with 3D Gel lettering - Wrapped lower middle part of front bumper between both fog lights - K&N Air Filter - Protected Recaro Fabric - Team Heko Deflectors (Surprise present of mummy) Future Plans:- - Milltek Exhaust - TRC Splitter - Tinted Lights - Mountune Spoiler Extensions - 6000k HID's - Mountune Short Shift - MP215 - Symposer Delete - Plastics Painted Gloss Black - LED Reverse Lights thats all i can think of for the minute.